A new study has found that a growing number of parents are waking up to the dangers of recommended childhood vaccinations, with many parents choosing to opt out of all vaccines for their children. More than 1 in 10 parents are now straying from the traditional vaccine schedule, and experts project the number to increase exponentially. The CDC currently recommends loading up children under 6 with a cocktail of vaccinations, including shots for MMR (measles, mumps and rubella), the seasonal flu, chicken pox, whooping cough, and hepatitis. The full schedule is listed on the CDC website. The seasonal flu shot, among the recommended vaccinations, contains more than 250 times the safety level of mercury as set by the EPA, and has been found to only be 1% effective in actually preventing influenza. It has also been linked to narcolepsy, a deadly nerve disease, and death. But the health consequences do not stop there. The hepatitis B shot also tops the recommendation list, which has been tied to several serious conditions. Vaccinating with hepatitis B has been tied to sudden infant death syndrome (SIDS), multiple sclerosis, and numerous chronic autoimmune disorders. Hepatitis B vaccine dangers have even been established by a court ruling. Tambra Harris … filed a petition for compensation alleging that she suffered certain injuries as a result of receiving a vaccination. Among the injuries petitioner alleged that she had suffered as a result of receiving a hepatitis B vaccination was systemic lupus erythematosus (SLE) … A lump sum of $475,000.00 in the form of a check payable to petitioner as Administratrix of the Estate of Tambra Harris. In increasing numbers, parents across the country are contacting the National Vaccine Information Center (NVIC) to report opposition to regulations being enacted by state health department officials that legally require children to be injected with three doses of hepatitis B vaccine before being allowed to attend daycare, kindergarten, elementary school, high school or college. Simultaneously, as more schools and employers bow to pressure from government health officials and require individuals to show proof they have been injected with hepatitis B vaccine before being allowed to get an education or a job, reports of serious health problems following hepatitis B vaccination among children and adults are multiplying. Parents are beginning to wake up to these dangers, protecting future generations from becoming scientific guinea pigs in which to examine the long-term effects of vaccinations such as Gardasil and H1N1. 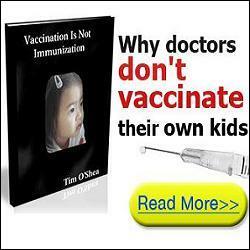 As the word about vaccine education is spread like wildfire, the number of informed parents and individuals will explode, leading to an eventual scientific reform of ineffective and deadly vaccinations. Please take part in Vaccine Information Week by sharing this article, as well as the many other KEY ARTICLES demonstrating the dangers of vaccines. Please also visit Natural Society for more great health news and vaccine information. Be the first to comment on "Survey: Parents Waking Up to Vaccine Dangers"